At last weekend's women's hockey game, Augsburg celebrated the achievements of the 1999-2000 Augsburg women's hockey team. 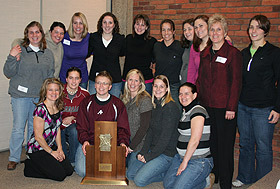 Ten years ago, the Auggies finished second in the American Women's College Hockey Alliance Division III championship. The 1999-2000 team was recognized on the ice between the second and third period of Saturday's game against Concordia-Moorhead. Coach Jill Pohtilla, who has led the Auggies since the program was launched, said she wanted to be able to "bring back old memories and bask in the old days" with the event. After the game, the players shared memories of their Augsburg hockey experience at a reception. Kristi Hoffman, a player on the 1999-2000 team said, "It was a very important part of my life during which I discovered the importance of teamwork and friends." Most of the 1999-2000 team still stays in touch by playing together in an adult hockey alumni league. Five of the players are currently playing in the WHAM hockey league, and many others are still involved with the sport. Augsburg established the first collegiate varsity women's hockey program in the Midwest in 1995. The 1999-2000 team, which finished 21-7-1, played Middlebury (Vt.) for the AWCHA title. In 2001-02, the NCAA began its own Division III national women's hockey tournament. The 1999-2000 team is one of only two Augsburg women's hockey teams that won 20 or more games in a season. Prior to the series against Middlebury, Augsburg had gone 17-1-1 in its previous 19 games. Watch the video of the reunion.